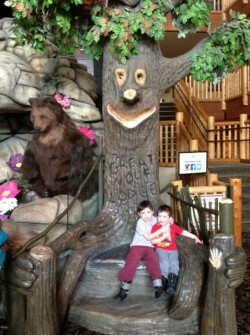 Great Wolf Lodge is an ideal option for a quick getaway with the family. And, although the priority of the magical forest-themed resort is to cater to the imaginations and the size limitations of their younger guests, the entertainment factor engages children of all ages. My family (including two young boys – two and four years old) visited the Niagara Falls, Ontario location in February. It’s all about magic, fun and smiles. – Spa – the most relaxing feature for me! – MagiQuest, an adventure game that allows children (or their parents, as you will definitely say, “Let me try”) to “make things happen” with the wave of a wand. Point your wand at a picture and it will speak. Point your wand at a statue and the eyes will light up. – Huge indoor Water Park with various slides and areas for the very young children, as well as for the older children. I don’t know who enjoyed it more – my sons or my husband! – Bring snacks and cold food for breakfast/lunch (i.e. fruits, bread, cereal, etc.). There is a semi-private living area, a microwave, fridge and a coffee maker in the rooms. Although there are restaurants on site, it’s helpful to have some food on hand, as it can get pricey. In terms of policy, the GWL website says, “No outside food or beverages are permitted in the water park, however, there are areas designated outside of the water park for guests to dine on their own food.” Suggested meal plan for our next visit: Quick, easy breakfast in our room, pizza lunch (available at resort) and dinner at Camp Critter (buffet restaurant at resort). – Another way to save on a booking, is to become a “member,” which means you will receive emails notifying you of price deals. You can become a member by signing up on the Great Wolf Lodge website.